dot certified | Drum It Up! Why Use Steel Drums for Dangerous Goods? Steel drums are one of the most popular containers for a variety of materials — including hazardous materials and dangerous goods. Several factors have contributed to steel drums’ rise to popularity in the shipping and storage of dangerous goods, but the steel drum experts at Skolnik have found that you don’t need to dig that deep to discover the main reasons steel drums are used for dangerous goods. Steel is strong. Sure, there are plastic and paper containers, but metal is stronger. Airplanes, aircraft carriers, and trains are made of metal, not plastic or paper. Strength is important when handling and transporting classified dangerous goods — therefore, more businesses choose steel drums over fiber or plastic drums, and more UN and DOT regulations require or recommend steel containers for dangerous goods. Steel is rigorously tested. Steel drums meet the highest levels of test performance of all non-bulk packaging. Skolnik steel drums are rigorously tested to meet stringent UN and DOT certifications, but also just to meet our own high-performance standards. We design and manufacture steel drums that get the job done and then some, and we test them accordingly. Plastic and fiber drums are not tested with the same intensity and precision as steel drums. Skolnik steel drums are special. We offer a range of packaging options, we specialize in steel drums and our engineers can customize drums for our customers’ unique needs. We are a company whose pulse is to find solutions to particular packaging, shipping or transport problems. We offer a diverse range of customization options including diameters, height, metal thickness, packaging, protective coatings, closures, placement of plugs and more. 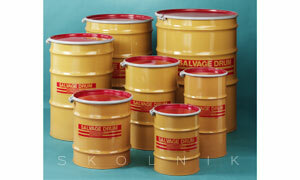 And, Skolnik steel drums are manufactured thicker, heavier and stronger than the industry standard requires. We specialize in industrial packaging for critical contents and we recommend steel as the material-of-choice for packaging, storing and transporting dangerous goods and hazardous materials.